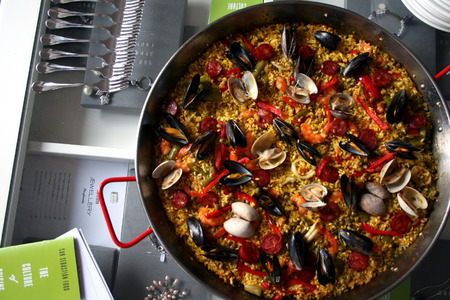 Whether you look at a paella and think "wow!" or "that's like Spanish pizza", or "that looks difficult" (like I used to) or "that looks easy", it probably is the most emblematic Spanish thing besides bulls. In fact, whenever I want to make somebody from Spain laugh, or whenever they talk about Americans and their hamburgers, I let them know that for us, they are all lounging around eating paella, drinking sangria, and watching bullfights. So to some, it may seem incredible that I've never gotten around to making one. But really, it's not. For one, it requires special equipment, something that always deters me. In this case, a huge round pan the size of four burners. 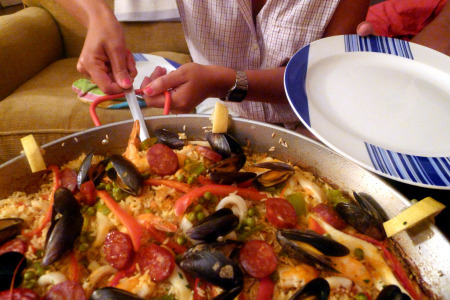 For two, I'd never really had a good paella, since 99% of my "Spanish" experiences have actually been Basque. Having crossed the battlefield, I'm happy to report that paella is a)delicious and b)not so hard. I threw caution to the wind and invited three friends over for dinner on my first night. Lucky for me, one of them has a grandmother with extensive paella experience. She was able to advise me on some small changes to the recipe I was working with, like throw the red peppers in with the green instead of waiting until the rice is half-cooked. For all its infamy and the fear it strikes in anglo-saxon hearts in the kitchen, paella is housewife-friendly. After all, the bulk of the cooking is no-stir, no-touch. Compared to a risotto, for example, it's relatively labor-light. No hay más misterio. Except for the socarrat. That lovely golden crust that everyone (even people who've never had paella and have no idea what they're talking about) will rave about. It forms on the bottom of the pan, but it has to happen in perfect time and slowly, so the rice is done as the crust begins to form (and you don't add more liquid and deglaze the crust). And you can't really cheat too much by turning up the heat, or it has more of a burned taste. My friend was standing with me at the stove, and she suddenly goes "that's it, that's it, that's it!". Her nose knew, and you could hear, when the rice was forming that delicious golden brown layer. Beyond that, it's up to you. 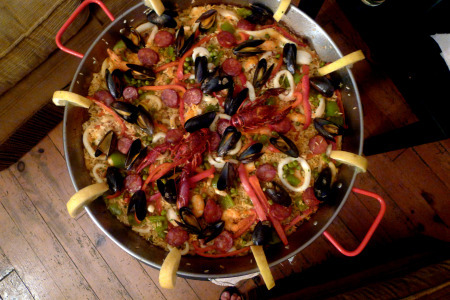 I showed a friend from here (Basque, though, so not quite an authority) a picture of the paella, and his response was "too many things". The word "aberration" was floated in regards to the chorizo. In fact, strictly speaking, the original Valencian paella is chicken or rabbit, green beans, snails, and fresh lima beans. But c'mon, I'm a guiri. And it tasted pretty dang good. Peel the shrimp. Put the heads and shells of the shrimp and the fish head in a pot over high heat with lots of water (a potful, if you have to measure, somewhere around a gallon). Add a pinch of salt, simmer for 15 minutes. Heat half the oil over low heat, and cook onions for about 5 minutes, seasoning with salt. Add the tomato, and cook for five more minutes or until all is softened. Soak and clean mussels, removing beard and cleaning shells. Heat a little bit of oil over high heat, add shallots, thyme, bay leaf and chile. Cook one minute. Add mussels and a pinch of salt, stir and shake for a few seconds, then add the white wine. Cover, and cook until they steam open. Drain, reserving liquid. Add shrimp stock to this liquid until you have about 8 cups. Reserve the remainder of the shrimp stock for later. Heat the liquid mixture until almost boiling. Heat the tomato onion mixture in paella pan. Add the remaining oil and the red and green peppers, cook about 5 minutes. 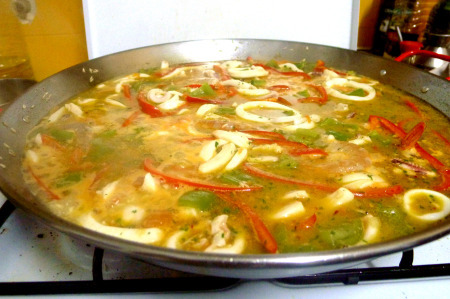 Add squid rings and rice, as well as another pinch of salt, stirring occasionally to prevent burning, for about 5 minutes. Meanwhile, pound parsley, minced garlic, and saffron in a mortar until homogenous. Add a bit of warm water. Add the hot liquid mixture to the rice, stir. Add the parsley saffron mixture , stirring. Stir in the shrimp and allow to cook. Once half the liquid is absorbed, arrange the shellfish, chorizo, and peas attractively on top of the paella and cook until the liquid is absorbed. It may be necessary to add more liquid as you near the end, just taste the rice and monitor it until you get a feel for it. In total, it seems to take around 30 minutes. You can also cover it with foil the last few minutes to ensure even cooking of the top rice. 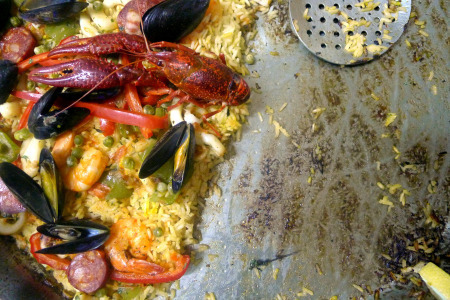 Remove the paella from heat and cover with a towel while it rests for 5 minutes. Serve with slices of lemon.